The growing pains of digitisation involve intense struggles between competing ideological systems and contesting societal actors – market, government and civil society — raising important questions about responsibility and accountability. Two large ecosystems rule the global online world: a Chinese and an American-based ecosystem. The latter has overwhelmingly penetrated Western-European societies, disrupting markets and labor relations, circumventing institutions, transforming social and civic practices, and affecting democracies. Online platforms paradoxically bypass the institutional processes through which European democratic societies are organised, while at the same time they clash with local, national, and supra-national governments over who controls data-flows and algorithms. Online architectures are governed by platform mechanisms (e.g. datafication and commodification) that dominate both private and public sectors. Public values and the common good are the very stakes in the struggle over the platformisation of societies around the globe. This lecture concentrates on the position of European (private and public) interests vis-à-vis the interests of an American-based online ecosystem, driven by a handful of high-tech corporations. At the heart of the online media industry’s surge is the battle over information control: Who owns the data generated by online social activities? Who is responsible for anchoring public values in an online world? Particularly in the European context, governments and civil society organisations can be proactive in negotiating public values on behalf of citizens and consumers. José van Dijck is a distinguished university professor at the University of Utrecht (The Netherlands); she was the president of the Royal Netherlands Academy of Arts and Sciences from 2015 until 2018. She was a visiting professor at MIT (USA), University of Toronto (CAN), Stockholm University (SWE) and University of Technology, Sydney (AUS). She received an honorary doctorate from Lund University (SWE). Van Dijck’s academic field is media studies and digital society. Her work covers a wide range of topics in media theory, media and communication technologies, social media, and digital culture. She is the (co-)author and (co-editor of ten books and over one hundred journal articles and book chapters. Van Dijck’s book The Culture of Connectivity. A Critical History of Social Media (Oxford UP, 2013) was distributed worldwide and was translated into Spanish, Chinese and Farsi. 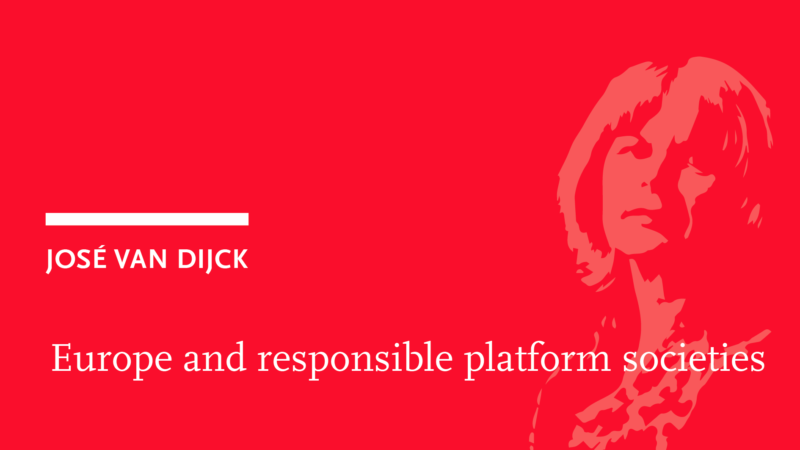 Her latest book, co-authored by Thomas Poell & Martijn de Waal is titled The Platform Society. Public values in a connective world (Oxford University Press, 2018). The current rapid pace of technological change creates enormous uncertainties – and thus the need for explanations that help us better understand our situation and shape the future. The Alexander von Humboldt Institute for Internet and Society (HIIG) and the Federal Agency for Civic Education (bpb) are therefore continuing the Lecture Series Making Sense of the Digital Society that was launched in 2017. The aim of the format is to develop a European perspective on the current processes of transformation and its societal impact. The first speaker of this year’s series was sociologist Eva Illouz, followed by Dirk Baecker. Louise Amoore will be the upcoming speaker on 1 July. The registration for the lecture will be opened on 7 May, 10 am.